Arriving in the Himalayas I didn’t have a clear idea how my trip would fit together, everything was a rush. There was no grand plan; the decision where to start my trip was left to the very last minute whilst I stood in Delhi bus station. I had a lot of ideas, probably too many. Ultimately I knew that the weather would dictate how these ideas would fit together. How early or indeed how late winter approached in these regions would necessitate forming a new plan on the fly and with it migrating south wards to buy myself some more time in the mountains. 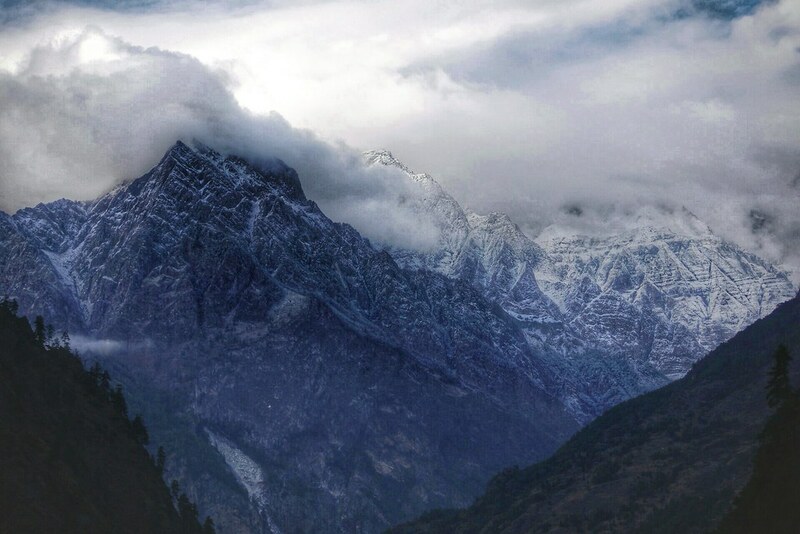 After travelling from the Spiti valley in India’s north west Himalaya to Sikkim in the Himalaya’s eastern reaches one thing was certain, winter had come earl. Unseasonal amounts of snow in northern Sikkim scuppered my plan to ride one final 5000 metres pass on this trip. 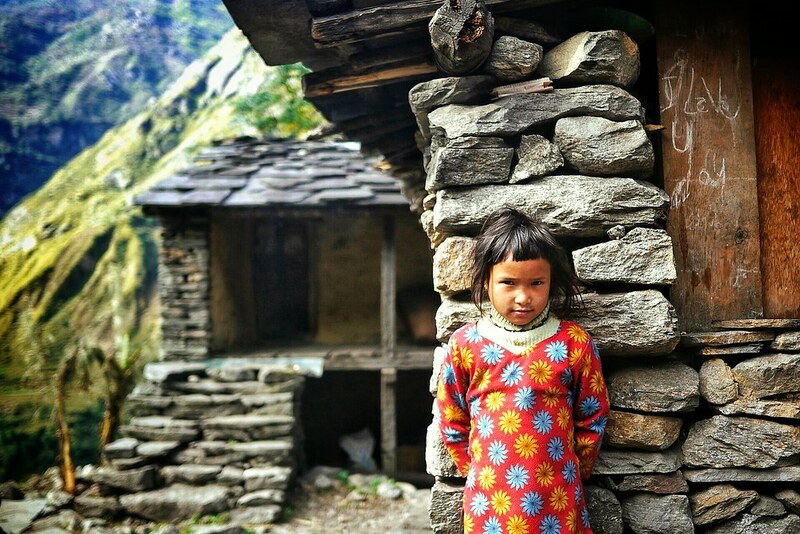 With Sikkim’s close proximity to Nepal I was keen to explore the Manaslu region an area I had discovered after returning from Nepal’s Annapurna region earlier in the year. It was time pack the bike up and explore the high mountains on foot. With more permit restrictions and no independent trekking allowed it would mean trekking with someone else and the use of a guide. Through Trekking Partners I hooked up with Rick and after a series of emails we formed a loose plan to meet in Kathmandu and make the neccesary arrangements for permits and as it turns out a guide. 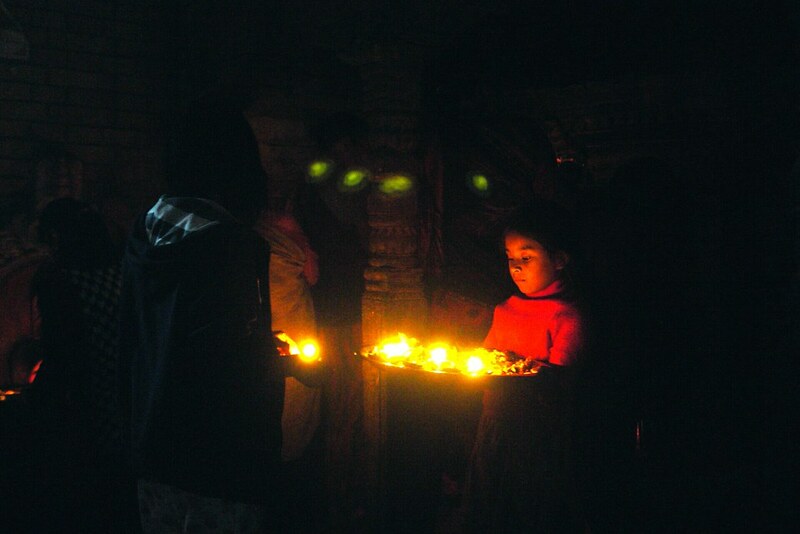 Our timing couldn’t have been worse, we hit Nepal during one of its many religious festivals. As government offices and businesses closed down for the festival of Tihar we were forced to spend 3 days waiting for our permits to be processed. 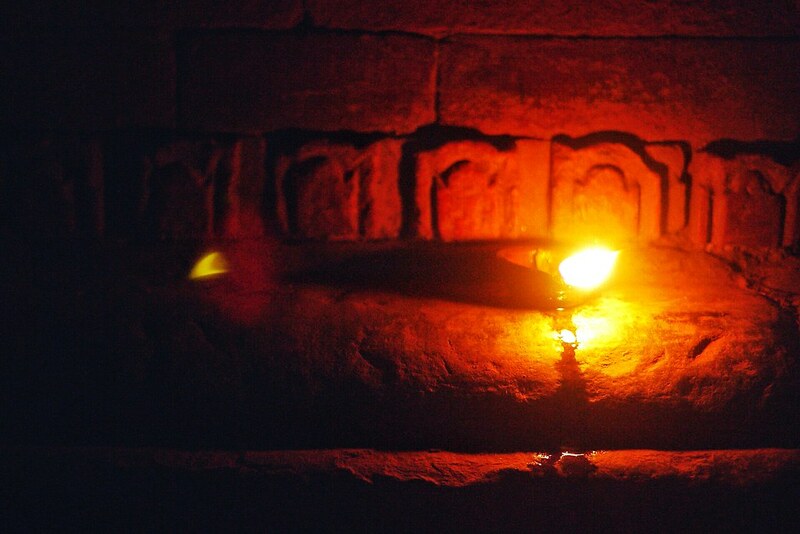 Despite our initial frustrations the festival of Tihar proved to be a fascinating. Each house and business decorated with lights, as darkness falls tea lights flicker in the street. Each day dedicated to the worship of a different deity. Staying in the Unesco world heritage site of Bhaktapur we get to explore the streets, sights and culture of this town on the edge of the Kathmandu valley long after the throngs of tourists leave and return to the hustle and bustle of Kathmandu. As the festival draws to a close our permits are processed and we are bound for the small town of Arughat. 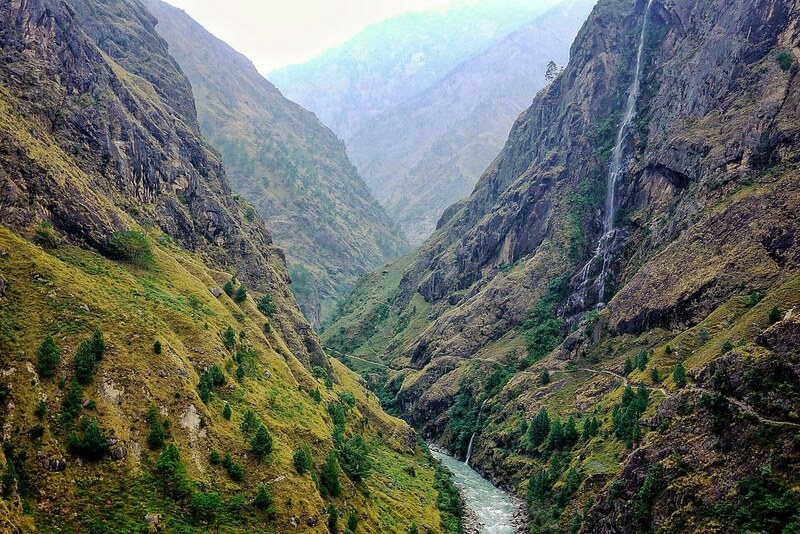 As bus rides go its memorable, trekkers and locals sit both inside and on top of the bus packed like sardines. The windows chatter and wheel bearings grind as the bus lurches up and down narrow dirt roads. As the mountains come in to view our minds are momentarily taken off our own personal discomfort. The roads become narrower and rougher, the wheel bearings complain more. After 7 hours we let out a collective sigh of relief as the bus lurches in to the small town of Arughat Bazaar. Arughat Bazaar is a typical Nepali frontier town, a downbeat street packed with ubiquitous general stores. Crisps and chocolate sit alongside a wide variety of other products all gathering dust. The dirt road out of the town follows the Buddhi Gandaki, which we ultimately follow to its source high above Larkya Bazaar. Alongside the road we come across one of several swings erected by Christian missionaries. Rickety and clunky, the kids clearly enjoy them! Over the next few days we leave the road behind, jeeps and the occasional bus give way to mule trains and pedestrian traffic as villagers go about their daily business and we settle in to life without motorised vehicles for the next week. 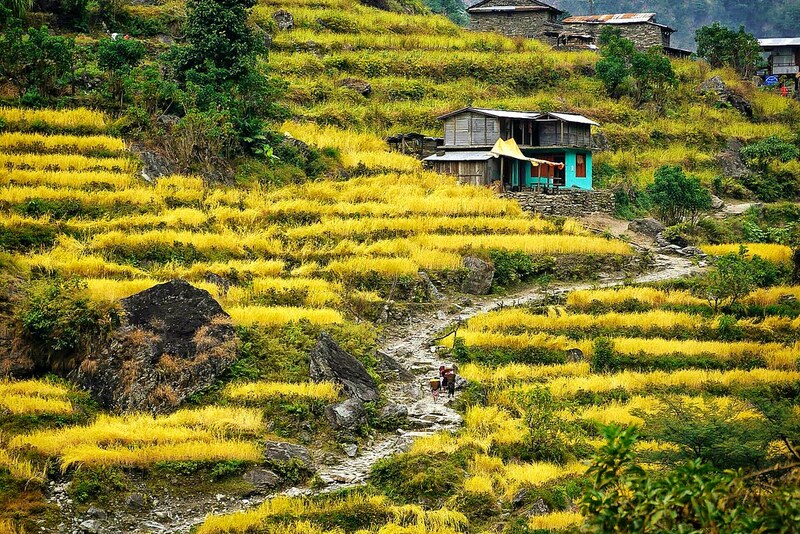 The trails wend their way through paddy fields, small villages and settlements. Passing each of the simple dwellings offers a glimpse inside. Each glimpse offering a fresh perspective on the family unit and the life these people live. 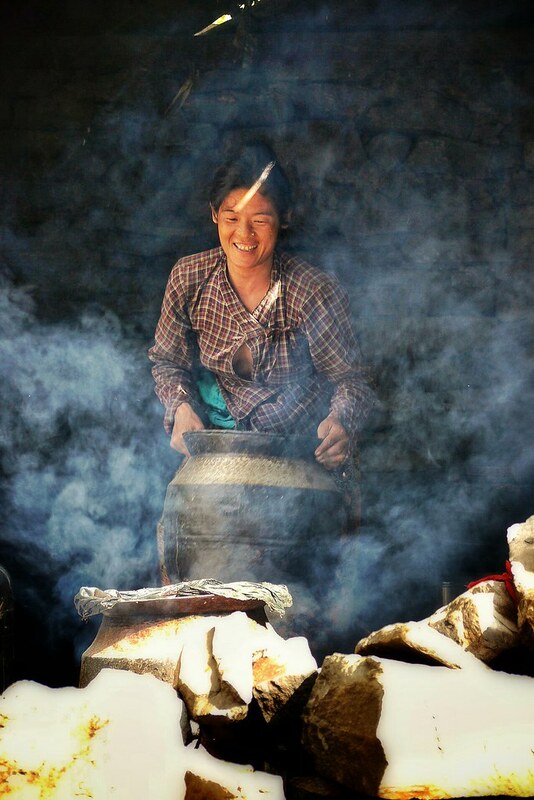 The dwellings are basic by our standards, tin roofs, bare wood floors, pots simmering on wood fires. Yet you will struggle to see anyone looking unhappy or stressed. Life is simple. Occasionally we pass women making Racksi the local spirit. 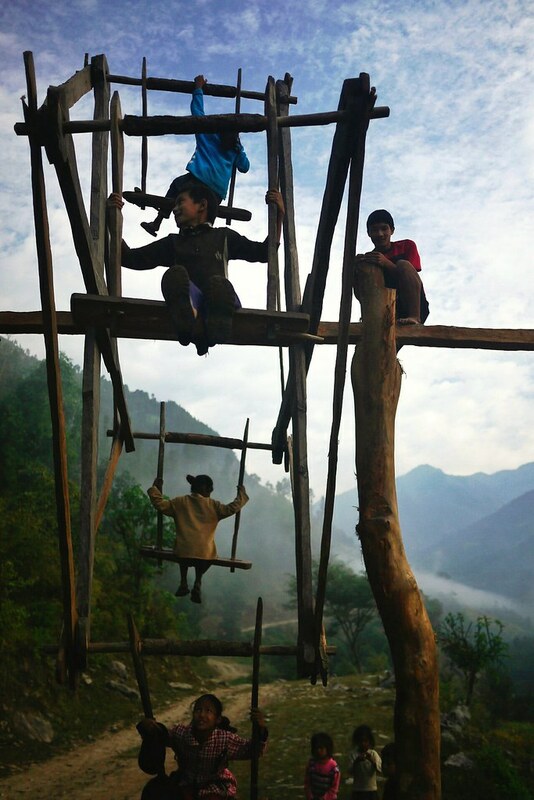 Makeshift wooden bridges give way to suspension bridges as the tribuatiries of the Buddhi Gandki increase in scale. 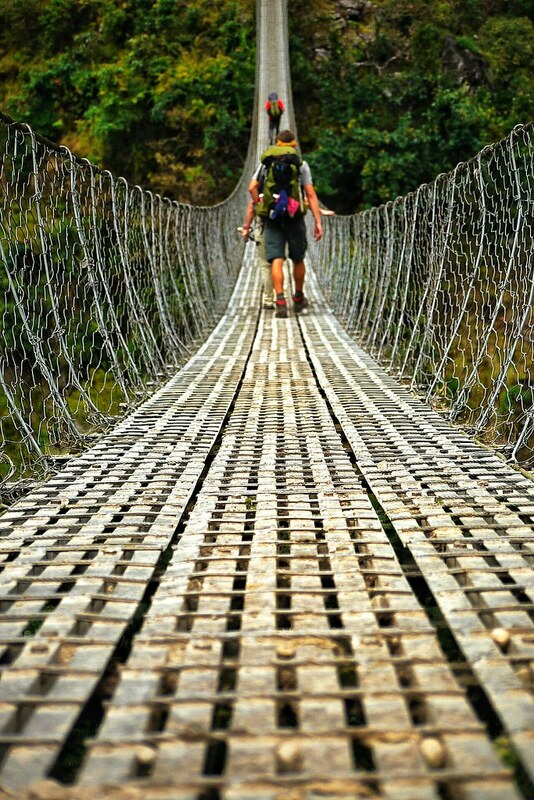 Several suspension bridges are crossed each day, its easy to loose count how many you have crossed. Frequently we descend back down to the riverside. The next couple of afternoons see us walking in cool light rain whilst it is refreshing, as the high mountains come in to view above Phillim it reveals a different tale. The Ganesh Himal range showing the snowline visibly below 4,500 metres lower than many of us had anticipated. Equipped with a large school and the Manaslu Conversation Area visitor centre it has an affluent feel with stone houses and slate roofs. Above Phillin the landscape becomes wilder, the valleys narrow and the river rages below. A thin ribbon of path leading off in to the distance, steep drops below and step cliffs drawing you in. 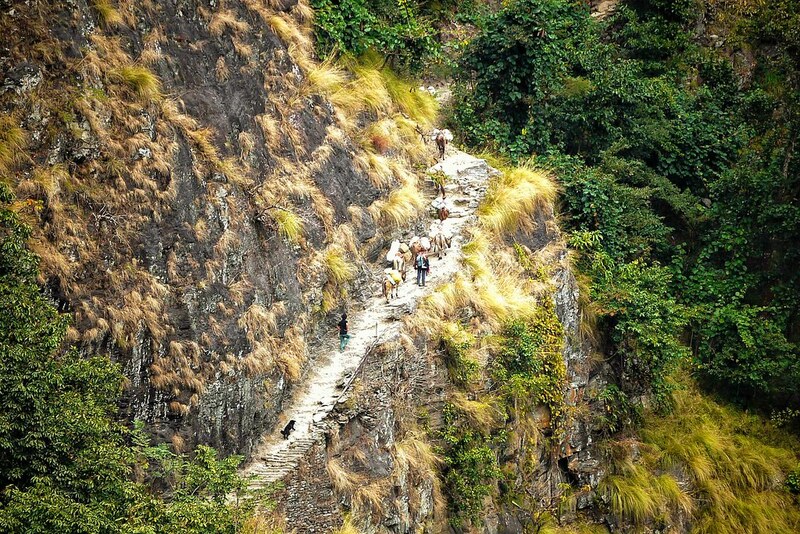 The narrow paths make it all to easy to get stuck behind slow moving trekkers, worse still are the dreaded French trekking groups with accompanying mule trains and porters. It becomes our raison d’etre to be on the trail first each morning. With a certain amount of unseasonal weather, sound bites of conversations between trekkers and guides can be heard in the tea lodges during the evening. Rick and I both reason that the next couple of days weather will dictate things and that we can only hope for warmer more seasonal weather which we have both been accustomed to on previous trips. The next day brings clear blue skies however by late morning we meet trekkers returning from the Larkya Pass (5,130 metres) Pinned high on the mountain in a solitary tea lodge for 3 days due to high winds and heavy snowfall rendering the pass impassable. Despite the uncertainty of what condition we will find the pass in, each days trekking offers some the best trekking I have ever done. As the high mountains open up the idyllic village of Namrung offers our first glimpses of Tibetan culture in this region. As the path weaves between the villager’s fields. 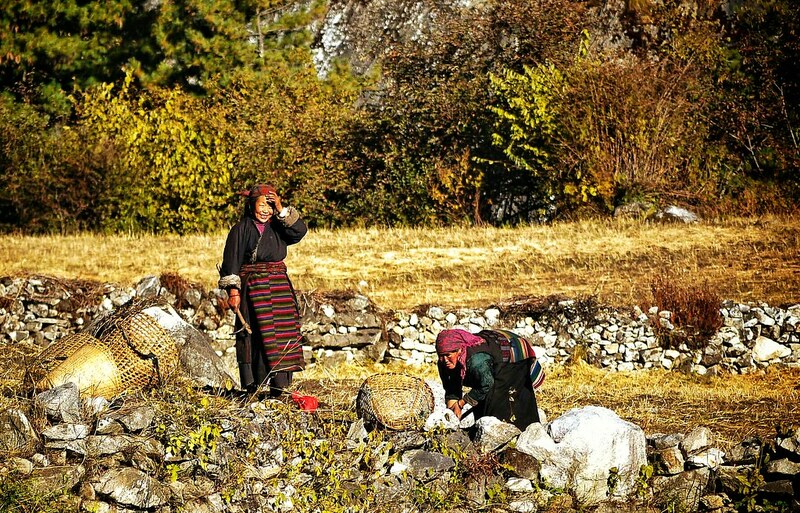 Tibetan women work the fields chattering and laughing amongst themselves. Their colourful aprons, rosy cheeks and wide smiles have a certain warmth about them. Life has a light hearted feel despite the obvious hardships that life in this area brings. 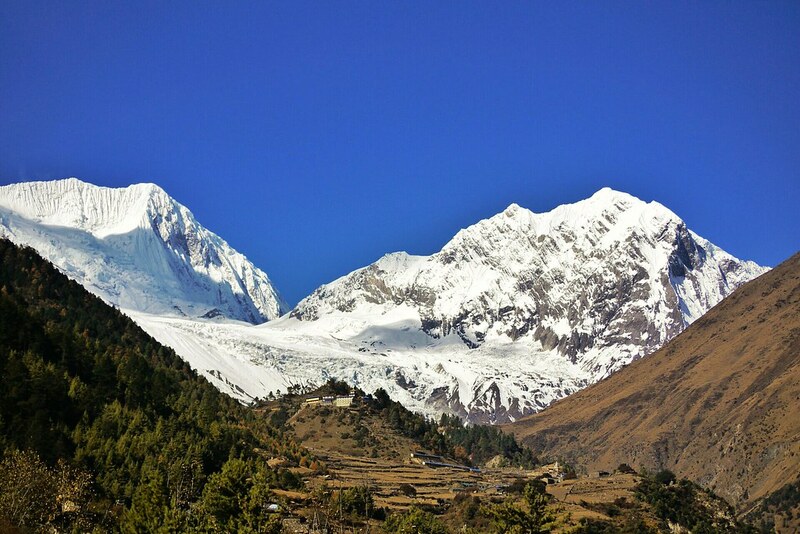 The Manaslu range provides an awe inspiring back drop to the Lho monastery. An afternoons walk from Lho through pine woods, ornate katans and deserted villages sees us emerge in the large settlement of Sama. An important staging post before the Larkya Pass the loads carried by mules are then transferred to yaks and porters. Yaks graze in large pastures before being taken to lower elevations for the winter. 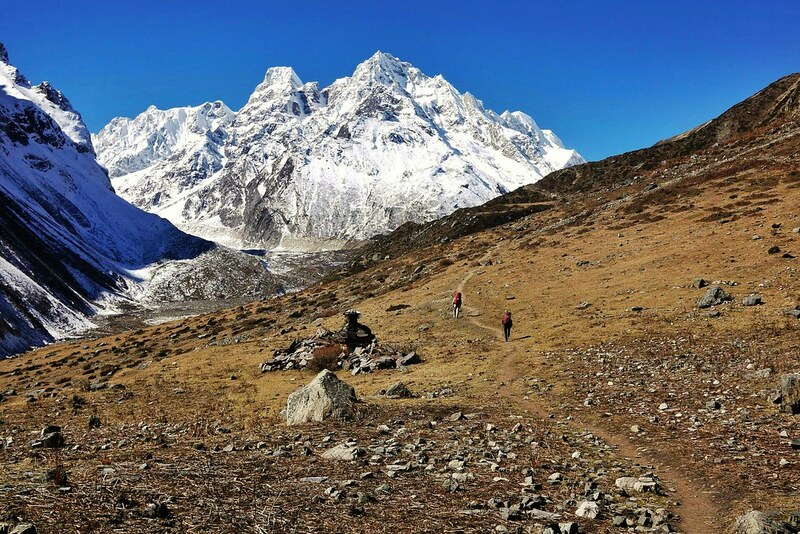 Sama stands at 3,500m and with views over the Punggen and Manaslu glaciers it seems the best place to take a rest day to acclimatise prior to crossing the Larkya Pass at 5,300m. 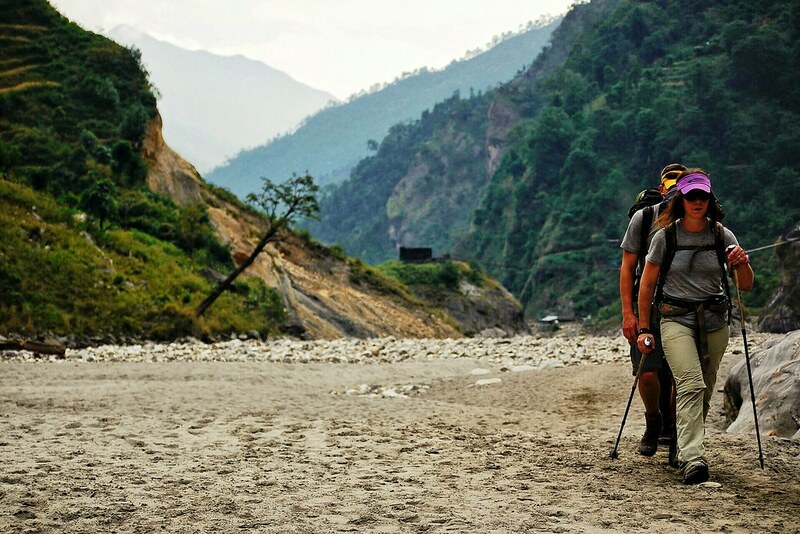 Both feeling little effect of the altitude, Rick and I decide to use our rest day to explore the area and head higher toward Manaslu base camp. 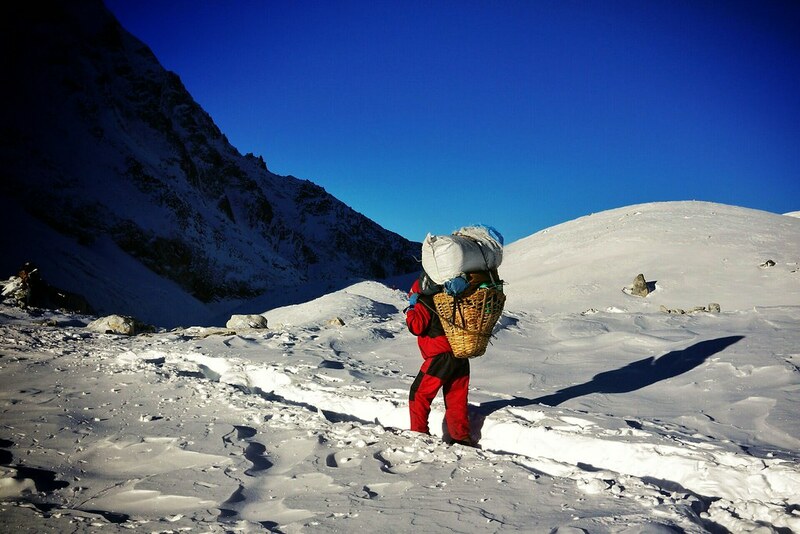 Local women leave the villages early each morning, on our way to base camp we meet them returning with their loads. 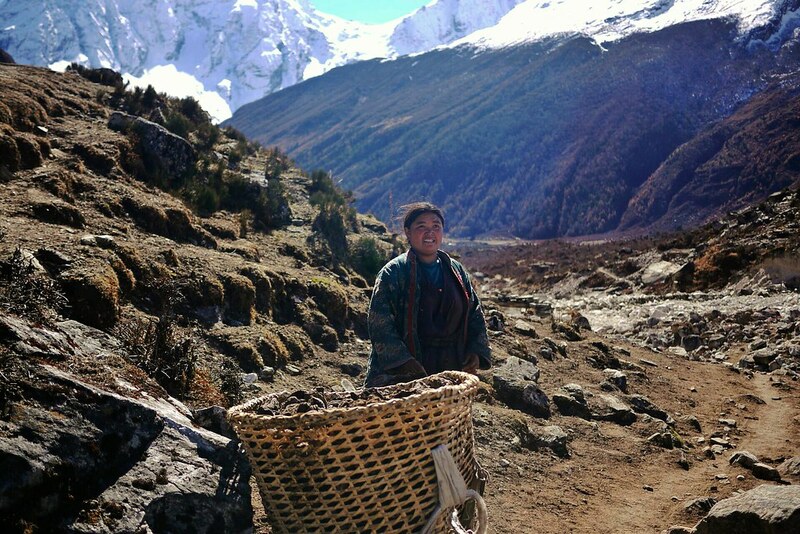 Mornings are spent replenishing their fuel supplies of Yak dung and wood. 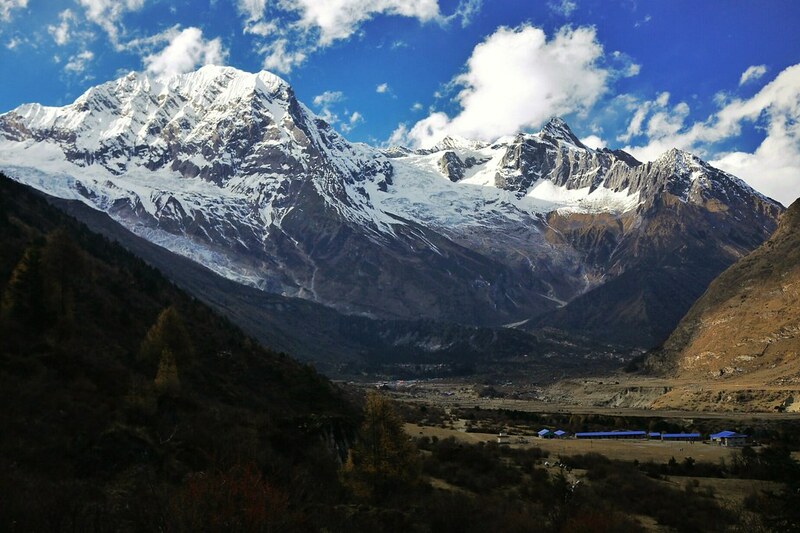 Climbing higher toward Manaslu base camp we spend an hour lazing around in the sun chatting and admiring the scale of the mountain and views over Birenda Tal and the Nubri valley. 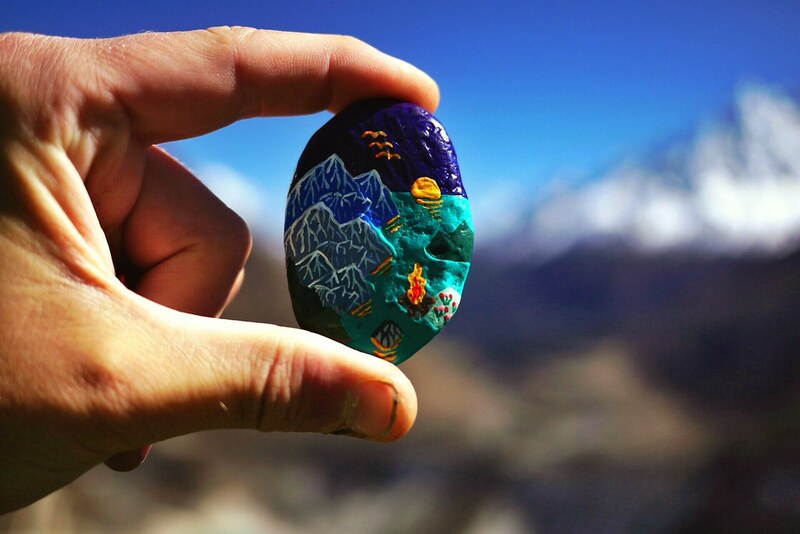 Rick introduces me to Summit Stones artistically painted mountain scenes on stones. We descend back to Sama for lunch, the conversation has a more upbeat feel about our chances of crossing the pass. After days of glorious weather only high winds or altitude sickness could prevent us from crossing the pass. 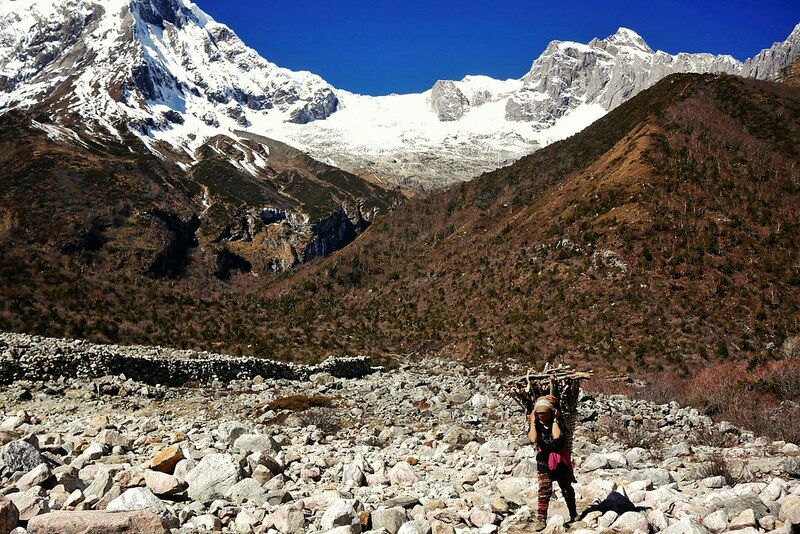 The next days walking takes us through a wide glacial valley and to the southern side of the Manaslu range with spectacular views of the Yanang glacier. The trails leading off in to the distance and ever higher. Despite enjoying the warm afternoon sun upon arriving at Samdo, it is a cold barren place once the sun drops behind the mountains. Carrying only a lightweight sleeping bag its a cold night spent fully dressed in all my clothing and a blanket kindly offered to me by trail buddies Brion and Betsy (thanks guys). As the temperature hits -20 Celsius the early morning start can’t come soon enough for me. The walk over the pass is a slow and steady. Purposefully setting off slightly later than some of the larger groups we benefit from them breaking trail and compacting the snow. A long trail of light stretches in to the distance, emphasising the number of people in front and the backlog of trekkers stuck due to bad weather over previous days. The cold is piercing unable to really warm up behind the slow moving group I’m reluctant to stop to take many shots and risk my hands getting cold. The light that morning was truly amazing, the only shot I capture is at the top of the pass as a porter passes me. With so much fresh snow the descent from the pass is sketchy. 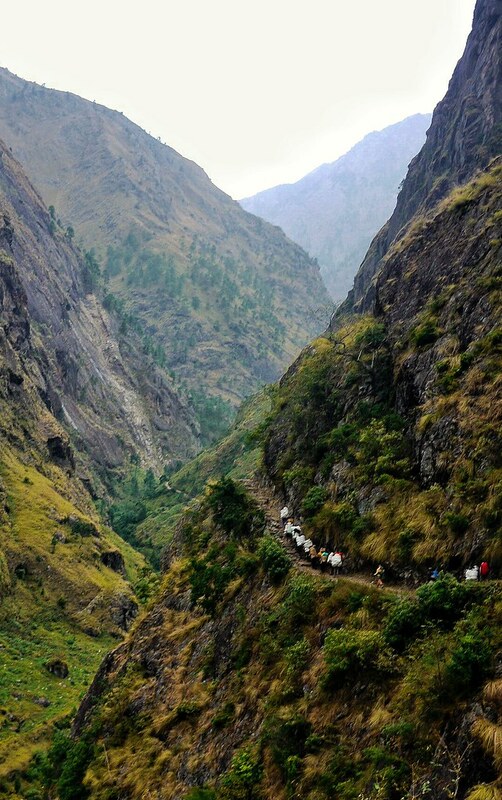 Trekkers and porters slipping and sliding down each section. Loosing over 1000 metres from the pass we begin to relax and strip off a few layers as the temperatures rise. Stopping for a few brief moments we begin to take in some of the beauty of the mountains around us. Descending to Bimthang everyone is in good spirits having crossed the pass easily, arriving early we relax and spend the afternoon reading and enjoying the warm sunshine. 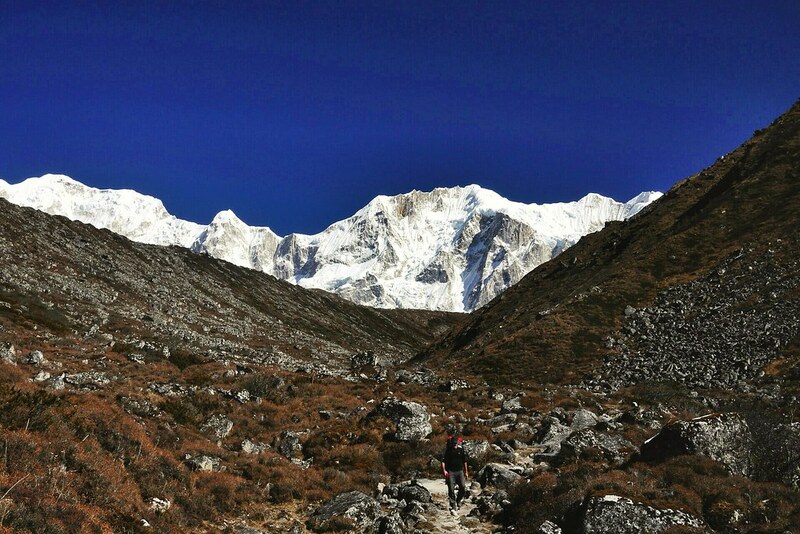 The final day of our trek around the Manaslu circuit sees us descend from Bimthang and in to the tree line. Familiar smells of juniper and pine return as we leave the cold and sterile environment of the high mountains behind. 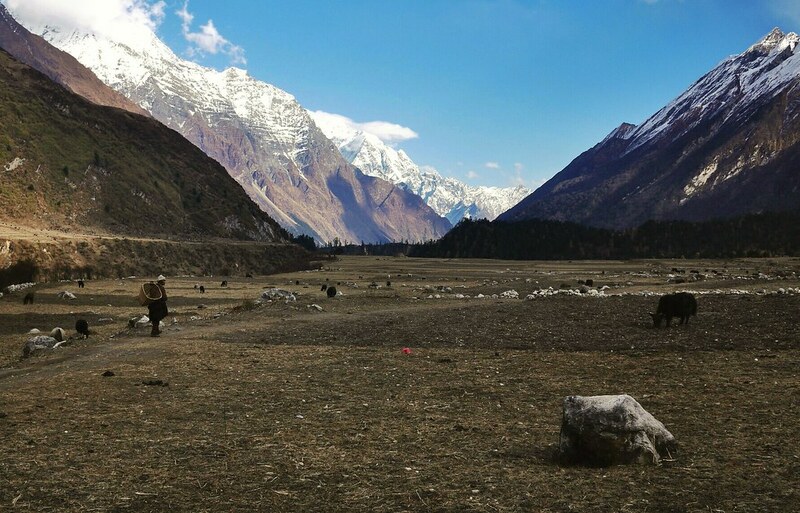 It is a long day spent descending to Dharepani, leaving the Manaslu Conservation Area and entering the Annapurna Conservation area the differences could not be starker. The standard of tea lodges instantly improves but with it also the scale of development is striking, numerous large lodges are being built perhaps sadder however is the highly controversial roads slowly being built both from the east and west of the Annapurna circuit which will see it fully motorable by sometime in 2017. 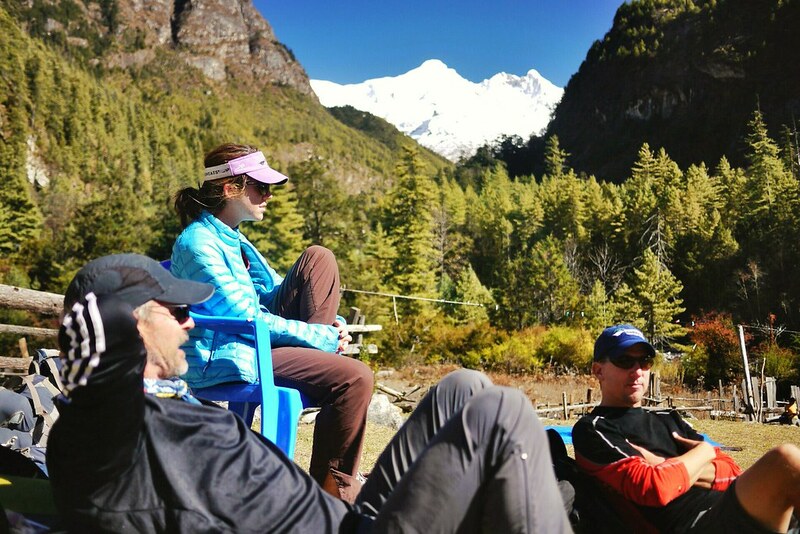 Enjoying the relative luxury of the lodges in the Annapurna Conservation area, we soak up the sun,conversation is relaxed and free flowing. The long walk offers time to reflect on an amazing experience spent amongst the mountains. The many sights and experiences of which form the cement of new found friendships. 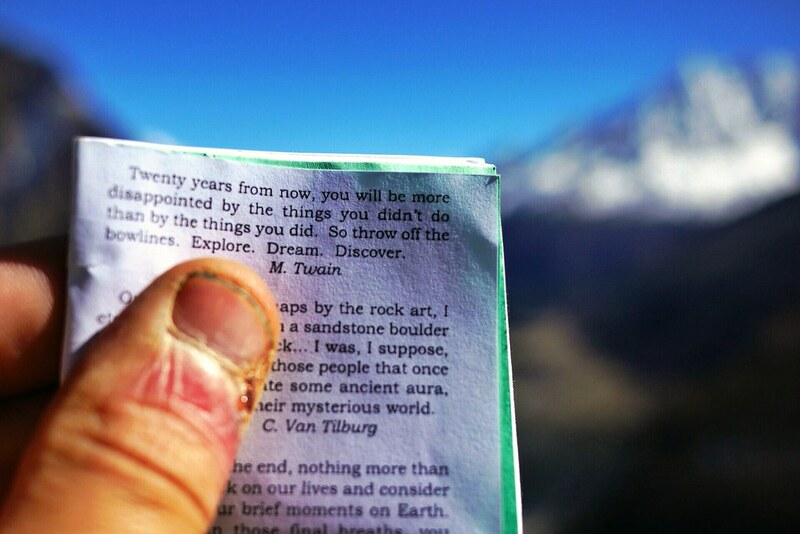 In total I spent 10 days trekking the Manaslu Circuit (Arughat Bazaar to Dharepani). Being on a relatively tight schedule after the delays in processing our permits I took avantage of the new roads on the Manang side of Annapurna to get back to the road head in Besisahar and onward travel to Kathmandu within the same day. Whilst I’m not a fan of the road construction it proved very convienent for me, unfortunately it has significantly changed the character of the Annapurna circuit and personally I would recommend the Manaslu circuit over the Annapurna circuit for anyone contemplating such a trip. 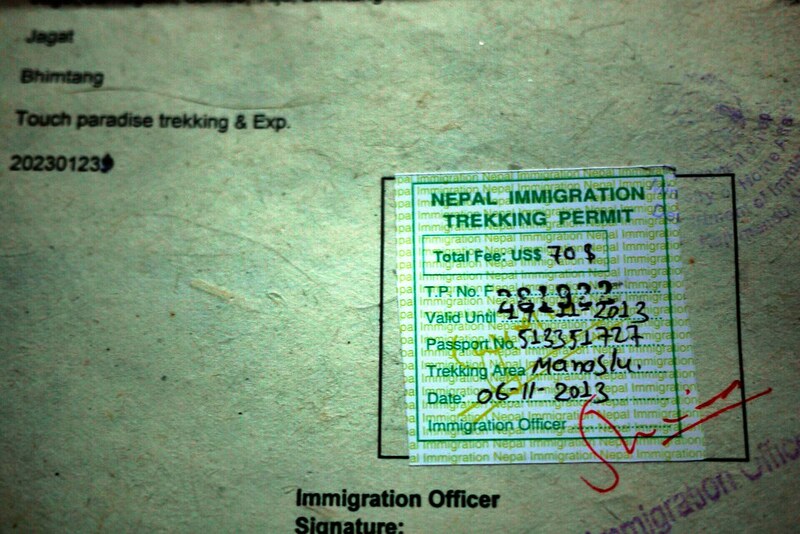 Rick also wrote comprehensive overview for anyone planning to trek the Manaslu circuit. Brion & Betsy – the not so newly weds. I thought you were off to South America????? I’m indeed in South America, Buenos Aires to be precise. I’ve just been catching up on a backlog of writing, more stuff to follow shortly. Hope all is well and wish you and your clan a Happy New Year!